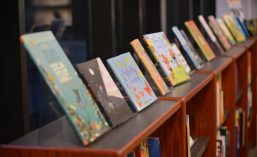 In honor of National Summer Learning Day here’s a roundup of some new STEM based fiction and picture books guaranteed to spark interest in a deeper dive into their subjects. Elephant wants to stack his blocks as tall as, well, an elephant. He’ll count, stack, evaluate, and build his way to success. With introductory concepts in math, problem-solving, construction, and good old-fashioned perseverance this a great tale for future engineers. Jamie Drake knows that each of his family members are like stars, keeping each other in orbit. He’s worked out the equation, and especially with his dad 400 kilometers away on the International Space Station, Jamie needs to make sure everyone and everything is in the right place to keep the Drake family intact. Christopher Edge brings math and science to life in this middle grade novel, giving them heart without sacrificing the integrity of the very real formulas and equations that make space travel possible. A bonus “The Science of The Jamie Drake Equation” chapter goes into more detail about the real-life science in the story, making this an easy tie-in to a solar system or space travel unit. Hopper, Eni, and Josh are back in the 5th installment of the Secret Coders series, which picks up where Robots & Repeats left off: continuing their battle against the evil Dr. One-Zero as he tries to control their town with his “Green Pop” potion. Luckily, they have Professor Bee and their coding skills to help them. Gene Luen Yang (National Ambassador for Young People’s Literature) and Mike Holmes continue to entertain with their fun characters and comic-style illustrations. Readers interested in basic coding and logic puzzles will want to start this series at the beginning, since both the plot and the concepts build off previous books! Cruz Coronado and his classmates will travel the world using science, exploration and conservation practices while training to be the next generation of National Geographic Explorers. All the while trying to evade a secret society that may be the cause of his mother’s mysterious death. The series (launching in September) will be supported by a digital extension (available now on the National Geographic Kids site) with games, videos, and “truth behind” content revealing the science behind the story. Fovea Munson is NOT interested in dead bodies! But spending the summer working in her parents’ cadaver lab is not helping convince her classmates she is NOT gross. While this sweet and funny story isn’t based in fact (have you ever met a partially-frozen, singing head? ), there is just enough medical science to get the curious doing their own research into dissection and maybe even medical school.